As an industry leader in product sourcing, we are expert in providing the best and finest quality products. We are a small family owned business that strives to give you the best customer experience possible. We pride ourselves in customer service and satisfaction. We are here to serve you. We are an Authorized Dealer of every product we sell. We responsibly source our products from manufacturers to guarantee you get authentic products. 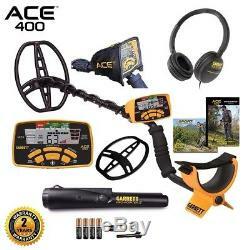 Garrett ACE 400 Metal Detector, Pro Pointer II Pinpointer, Coil, and Accessories. 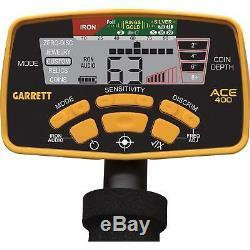 Garrett ACE 400 Metal Detector with DD Waterproof Search Coil and Pro-Pointer II. Garrett 8.5" x 11" Search Coil Cover - Protect your search coil against rough conditions and terrain. ClearSound Headphones - In-line volume control Rotating earpieces for easy packing. It's 41" coiled cord extends to 82". 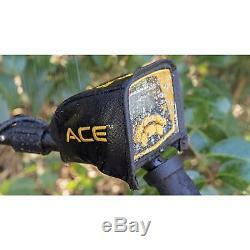 Garrett ACE Environmental Cover Up - Protect your metal detector's control box against mud and bad weather. Garrett 8.5" x 11" PROformance DD Waterproof Submersible Search Coil - DD configuration provides greater detection depth and performance by significantly reducing the negative effects of heavily mineralized ground and saltwater interference. 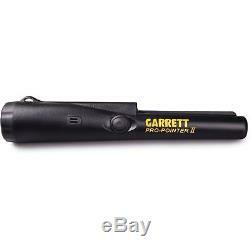 Garrett Pro-Pointer II - The Pro Pointer II combines performance with sleek design to assist in pinpointing those hard-to-find targets. 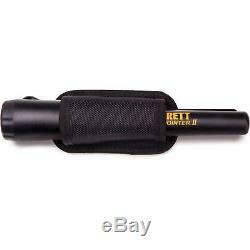 Adjustable Arm Strap - Holds detector tight tight to your arm for increased stability. 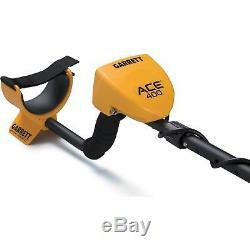 Garrett ACE 400 Instruction Manual - Instruction Manual to help assemble, take care of and learn how to operate your metal detector. Garrett Search Coil Hardware Kit includes Bolt, Washers and Nut - This kit includes the nut, bolt and washers that hold the search coil to the lower pole of your Garrett Metal Detector. 4 "AA" Batteries Included - Power your ACE 400 right out of the box. New Iron Audio allows user to hear discriminated iron targets and to alter the mid-tone signal range. New Digital Target ID with a 0 to 99 scale offers target information. New higher frequency (10 kHz) provides better sensitivity on low and medium-conductivity targets i. New Adjustable Frequency to help eliminate interference. New Camlocks for better stem stability. New Includes Pulse-Width Modulation audio for sharper, more responsive audio. Enhanced Iron Resolution gives twice the iron resolution of an ACE 250, to help separate good targets from adjacent junk iron. Includes Electronic Pinpointing to precisely locate targets and speed recovery. Notch Discrimination modifies discrimination patterns based on what you are seeking. Five Search Modes (plus Pinpoint). Coin Depth Indicator determines target depth. Expanded Target ID legend includes indication of U. Digital Target ID: YES, 0-99 scale. Target ID Cursor Segments: 12. Search Modes: 5 (plus Pinpoint). Audio Tone ID Levels: 3. Standard Searchcoil: 8.5" x 11" DD PROformance. Length (Adjustable): 42" to 51". Total Weight: 2.9 lbs. 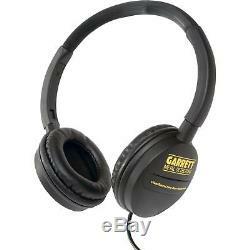 Please check out our full inventory of Garrett ACE 400 Metal Detectors. Let Coastal Tech USA serve you today! If for any reason you are not satisfied please contact me before leaving feedback. We are a small family owned business. If you are looking for the best prices and customer service, let us at Coastal Tech USA serve you. 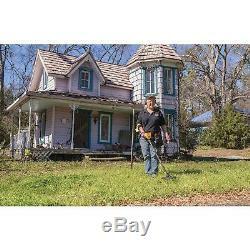 We sell only the highest quality metal detectors and accessories. We offer the highest standard in customer service. Simply put, we want to earn your business and customer loyalty. At Coastal Tech USA, we treat you the way we would want to be treated! We happily respond within 24hrs. 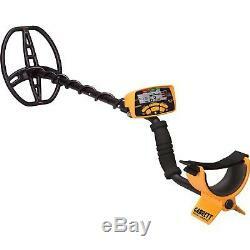 The item "Garrett ACE 400 Metal Detector, Pro Pointer II Pinpointer, Coil, and Accessories" is in sale since Tuesday, December 5, 2017. This item is in the category "Business & Industrial\Test, Measurement & Inspection\Test Meters & Detectors\Metal Detectors". 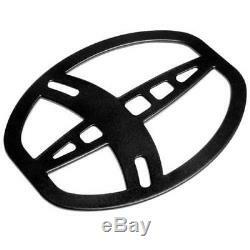 The seller is "coastaltech1" and is located in Chandler, Texas. This item can be shipped to United States.